Pittsburgh's first experiment in urban renewal and eminent domain is easily its most successful. "Renaissance" was the term used to proclaim the rise of downtown from the smoke, soot, and grime of its industrial heritage with a 36-acre park at the Point and 23 acres of commercial development between Barbeau and Short streets (now Commonwealth Place) and Stanwix and Ferry streets (now simply Stanwix St). Later attempts at redevelopment around the city claimed the term "Renaissance" Two, Three, etc., but were ultimately branded as short-sighted at best -- and usually as failures. The clearing of hundreds of buildings west of Barbeau St, including the Pennsylvania Railroad freight terminals, the vacant Exposition Buildings and all else save the Fort Pitt Blockhouse, began in May, 1950. The excerise of eminent domain in taking private property for re-use as a public facility, such as Point State Park, was seen as an acceptable enactment of the power -- but the true legal test came when the additional land out to Stanwix St was to be taken for re-development by a private firm for commerical use. Once it was determined that the state had the legal right to move forward, the Equitable Life Assurance Society was given sole rights to develop the cleared land with their commitment to build at least three new office towers. Plans were offered to create as many as fifteen of the cross-shaped towers. The first three were built between 1950 and 1953, and when nearby construction resumed following the Korean War other designs were used. The original towers were to feature more traditional brick and limestone exterior surfaces, but the plans were changed to specify stainless steel. Those plans were changed again to use the chrome alloy panels as built due to wartime shortages. The cruciform towers-in-the-park was an architectural ideal of the 1920s which had been promoted by Le Corbusier in Paris and built by Irwin Clavan in New York City in the 1940s. Clavan was one of the consulting architects in the Gateway Center design. Other buildings added to Gateway Plaza include The Hilton Hotel (1959), Gateway Towers apartment condominium (1964) and the parking garage topped by apartments at 625 Stanwix. 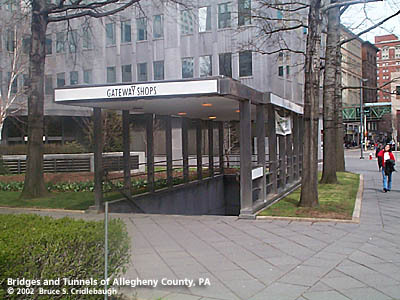 South of Liberty Avenue, another cluster of buildings grew up around Equitable Plaza: Four Gateway Center (1960), Bell Telephone and the Pennsylvania State Office Building. South of the Blvd of the Allies, the Renaissance was rounded out by the IBM (1964, now United Steelworkers), Westinghouse (1968), and the Pittsburgh Press (now Post-Gazette) buildings. With the exception of the city oldest's building, the Blockhouse, the Press Building is is the only building west of Stanwix St to remain standing, albeit reskinned, predating the redevelopment projects. view page - More information about Gateway Center south of Liberty Av [Equitable Plaza]. field check, Toker, "Pittsburgh: An Urban Portrait"; Lorant, "Pittsburgh"